Supports both OVH® EU, US & CA accounts. Register, transfer, Renew and manage domain. DNS Zone management (OVH Hosted) Limited to whmcs supported records type. Domain protection & EPP/AUTH Code management. Accept customers particular nic-handle for admin records. 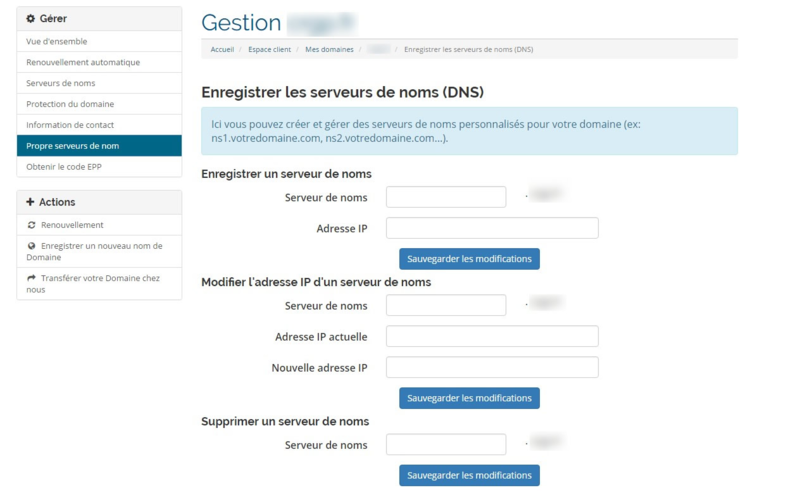 Ovh account : Pay the domains with the registered method of your choice. (Fidelity Account, Bank Account, Paypal®, Credit Card). DNS zone management in client area. ID PROTECT / OVH® OWO management. Working registration of .fr domains. ** Included :** 12 Months support and upgrade included. Thank you tomasz for your return. Glad that our module satisfies you. A must-have WHMCS addon if you need to manage OVH domains properly. Support is great and very responsive, I recommend it for any OVH reseller ! Thanks Vincent, happy to know you're satisfied with our module and our support. Regards. Any installation procedure please ? To be quick, Installation procedure is the same that for all the modules, publish the module in the modules/registrars directory of your WHMCS installation, then you'll have to configure it. The configuration procedure is delivered with the module. For quicker reply to your pre-sale question please use the support link rather than the review system, we usually answer to pre-sale question on our support ticketing system in the day. Not working even if the support sent me 3 fixes, they failed every time and were very unprofessionnal with me even if they were fast, I hope that it works for other people. They talked to me like you talk to your dog saying our hoster is managed by "kids" etc... Next to that, the VAT is not applicable to our organisation so I set a country were there is no VAT : they kicked me out but they refunded me, that why I put 2 stars. Ion cube loader 10.2 min. Added an [OVHFR] tag in the entries generated by the module in the activity log. This will allow a better filtering /research. Editing additional fields for particular TLDs. Renewing domains: Switching on the service / renew function of the V6 API. This entails several changes. Addition of a parameter (OvhForceManualRenew) in the file ovhfrini.php allowing the forcing of the renewal in manual mode at ovh during the synchronization of the domains of WHMCS (if sync activated). This setting is disabled by default. Payment method: Update available payment methods and application of changes concerning card payments, Paypal and bank transfer. Correction of the error procedure on IDPROTECT: now if IDPROTECT is activated for a TLD that does not support it, the parameter is omitted and the reservation takes place. A warning message is displayed for the client and an entry in the generated activity log. Change the class name in the OVH wrapper (OvhApi.php) to avoid conflicts with other modules using this one. Add Register & Transfer capabilities for : .pt, .it, .hr, .dk. Configuration of .fr domains registration standardized for compatibility with other added national tld. The version of module shown in registrars page haven't been update, sorry for this mistake. Will be corrected in the next release. The OpenSRS Domains Pro module allows you to register, renew and transfer domains from an ever-expanding selection of TLDs, including many new gTLDs. This module supports domain locking and WHOIS Privacy for select TLDs, as well as WHMCS Domain Sync. The ISPAPI Registrar Module connects WHMCS to your HEXONET account. Sell the best website builder. Add 6 website builder plans, including a freemium plan.